At Goats On The Road, we're all about extending travel and turning a trip into a lifestyle. We've now been on the road since 2008 and although at first, we were funded by savings from our 9-5's, we're now travelling in a fully financially sustainable way! Anyone who has been on a long trip knows the dreaded feeling of when that trip comes to an end. We're here to tell everyone that the vacation can be your life, rather than your retreat. We've found plenty of ways to make money abroad and travel forever, and here are a few of our favorites! This one is the single best way we've found to make money while on the road... but it takes a lot of time and commitment. We spent nearly two years building our travel blog, Goats On The Road, before we were able to start making money from it, but once we crossed that threshold, we were able to make an income doing something we love! If you enjoy writing, photography, media editing, filming, social media, travel, or any of the above, travel blogging may just be perfect for you! You can start a blog easily. Head over to GoDaddy.com and buy a domain that suits you, then pay for your hosting service (we highly recommend SiteGround) and you're ready to go. This money-making method is a bit easier if you have a travel blog, but having one is not completely necessary. You can find work by simply searching "freelance travel writing" online. You'll be able to find great, travel-related websites that will pay you money to write about your adventures! Sounds too good to be true? It's not. We've made lots of money in freelancing and if you're interested in writing, it's a great way to hone your craft and get your name out there. Me with one of my primary level classes. Yangzhou, China. You'd be surprised how many hostels, hotels and guest houses are looking for work. If you want to extend your trip, try asking for a job the next time you check-in for a night's stay! Many places will pay you for your work, while others may just offer you free accommodation and meals. Either way, working in hospitality is an excellent way to make your vacation into a lifestyle. House sitting is a great way to save on accommodation costs, but most jobs don't include pay. If you love being on the road, living like a local and experiencing new cultures, then house sitting is probably perfect for you! These days, finding the temporary home of your dreams is easy with sites like TrustedHouseSitters.com. We're currently pet sitting in a beautiful beach front villa on the southern Caribbean island of Grenada! All you have to do is sign up for Trusted House Sitters, pay the small yearly fee and add your profile, then you're well on your way to finding a home in paradise. Joining this program was one of the best decisions we ever made and we highly recommend it for anyone looking to travel forever. 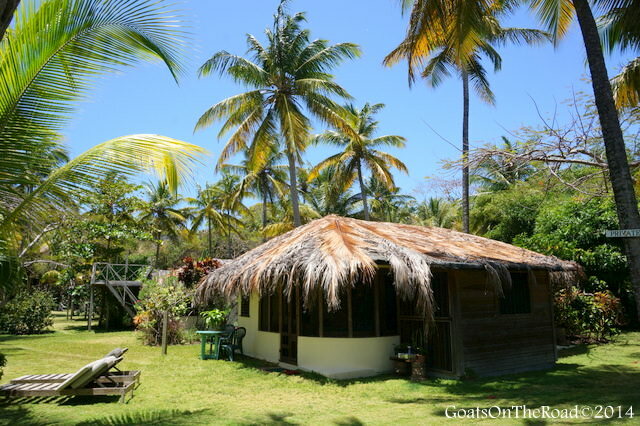 Our Beachside Cottage In Grenada. We're constantly researching and finding new ways to make money abroad and we find that working for ourselves while travelling around the world is both rewarding and exhilarating. We've been able to turn our vacation into a life of adventure and we hope that with these five new ideas, you will try it out for yourself! For more on making money abroad and travelling forever, click here!